All buses are 100 percent accessible. Many feature on-boarding ramp. 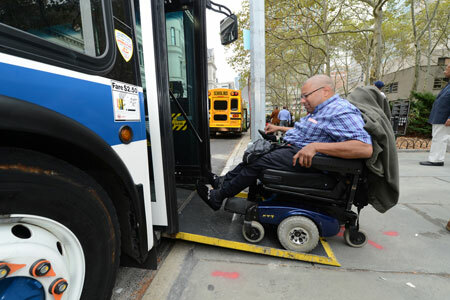 These web pages include detailed information about reduced fare programs and a variety of other ADA-accessible services MTA agencies provide. Click on the menu links on the left to find out more about these services, as well as paratransit programs. You may also find the “Useful Phone Numbers” link a quick and convenient reference source. In improving services to individuals with disabilities, the MTA identified stations where compliance with the Americans with Disabilities Act (ADA) would benefit the most people, analyzing such factors as high ridership, transfer points, and service to major areas of activity. These stations were given priority in our station-renovation program. We are continuing to expand accessibility features to more and more locations. In some stations, ramps constructed prior to the adoption of the ADA Accessibility Guidelines may not meet current ADA standards for slope, landing and handrail requirements. On commuter rail lines, some ticket offices and restrooms are not accessible by wheelchair.